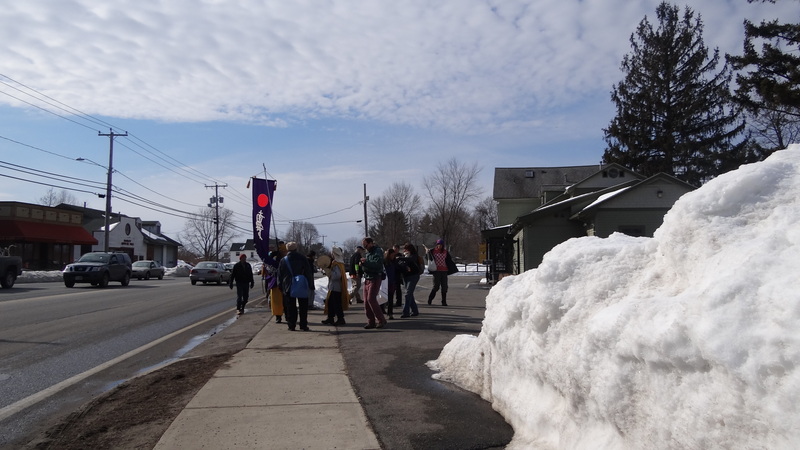 A wonderful second day for the Walk For a New Spring Peace Walk with blue skies and sunshine for over 35 participants who gathered at Pulaski Park in Northampton, MA. After Sister Claire spoke with sincerity and wisdom about our focus for the walk, the walkers chanted and drummed down the well populated Main St of Northampton and the high visibility thoroughfare of Rt. 9 towards Hadley, garnering many smiles, honks, waves and folks flashing the peace sign. The American Friends Service Committee with Jeff Napolitano and Nuclear Free Future with Hattie Nestle hosted us for a lovely lunch at the First Congregational Church in Hadley MA, where participants shared about upcoming and important nuclear free activist events and joined in some connection and laughter amongst themselves.